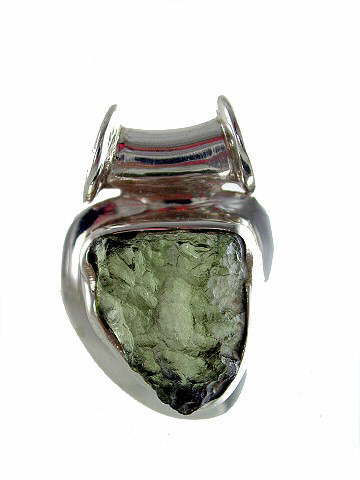 Excellent piece of natural Moldavite set in a substantial, fixed slide-bail, open-backed 925 sterling silver mount. About 20 million years ago a meteorite shower hit Earth, landing along the banks of the Moldau River in Czechoslovakia. These meteorites hit with such enormous force that the rock they struck melted, merging with the meteorite, and the crystal we now know as Moldavite was the result. Being found in only one location on the planet, it is a rare crystal with a beautiful translucent, bottle-green hue, and due to its origins, is a stone with extraterrestrial properties. When placed on the third eye, Moldavite helps us to establish a connection with the Cosmos, and when placed on the heart it teaches us to appreciate our gift and true purpose of being here on Earth. Moldavite in its natural or rough form is found in two types, 'Chlum' and the rarer type, 'Besednice'. Besednice Moldavite pieces are prized above all others not only for their rarity, but also for their exceptional colour and beautiful translucency. Besendice Moldavite specimens are also sometimes referred to as 'hogs' because of their hedgehog-like formation; appearing spiky with jagged or irregular edges.